Poster of The Latino Art Project that presents “Art to the Rescue”. 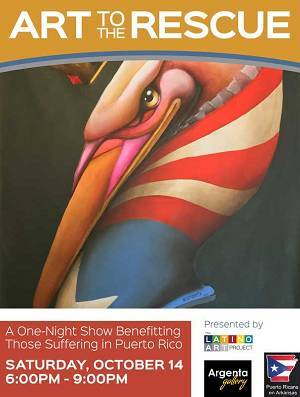 The Latino Art Project and Argenta Gallery of North Little Rock are proud to present "Art to the Rescue," an art event fundraiser benefiting the millions suffering in Puerto Rico in the wake of Hurricane Maria. Puerto Rico is in desperate need of supplies and resources. Like Texas and Florida, Puerto Rico was recently devastated by a natural disaster, but Puerto Rico's need is magnified by the island's geographic isolation from the U.S. mainland. It's been over two weeks since Hurricane Maria, but so far, help for Puerto Rico is in short supply. The Argenta Gallery, Puerto Ricans en Arkansas and the Latino Art Project have brought together over 25 local and regional award-winning artists that are donating art that will be available for purchase via silent auction. With all expenses associated with the fundraiser being donated, 100% of the money raised will go directly to those in need. Participating artists include: Ana María, Virmarie DePoyster, Emily Moll Wood, Lisa Krannichfeld, Daniella Napolitano, Jennifer EMILE Freeman, Jorge Villegas, Maria Villegas, Jeannie Rodriguez-Stone, Lisandra T. di Liberto Brown, Norwood Creech, Janice Chaparro, Barbara Saterfield, Bryan Clifton, Christie Young, James Hayes, Diane Harper, Gene Sparling, Gertrude Casciano, Shelley Gentry, Robert Bean, Elizabeth Weber, Morgan Herndon, Gertrude Casciano, Miranda Young-Rice, Julie Holt, Shelley Gentry, Sandra Sells and Karlyn Holloway. "Art to the Rescue" will be held at Argenta Gallery on Saturday, October 14, 2017 from 6:00pm to 9:00pm. Argenta Gallery is located at 413 Main Street, North Little Rock, AR. Please contact Will Hogg at 501-416-0973.